DASH photo of COLLETT hangar deck. Taken in 1967-1968 from a black and white 12" TV monitor in the Sonar room. The image is from a camera mounted under the DASH (instead of torpedoes) and it is looking at the helo deck while landing. The men flying the DASH are behind the short wall at left. The hangar door has a poem written on it by Ron Burley to welcome and entertain the manned helos who came there to refuel. What looks like a horizontal, dashed, white line about shoulder height is actually parachutes symbolizing downed airmen in whose rescue COLLETT participated. One of the two men on the right may be Swede Michaelson. 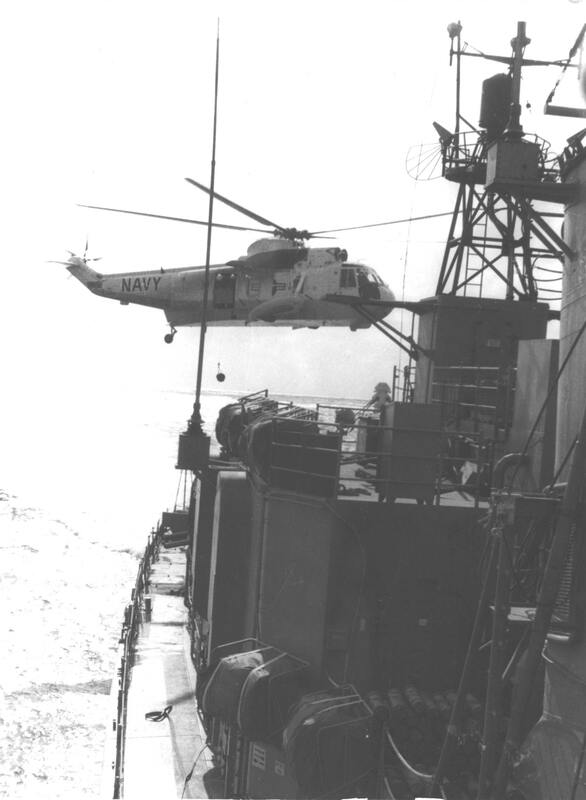 Manned helo coming in to the flight deck to pick up the refueling hose.